Pop and market your profitable popcorn products all in one convenient place with this Carnival King PMW17R 8 oz. Royalty Series popcorn popper and warming / holding merchandiser! 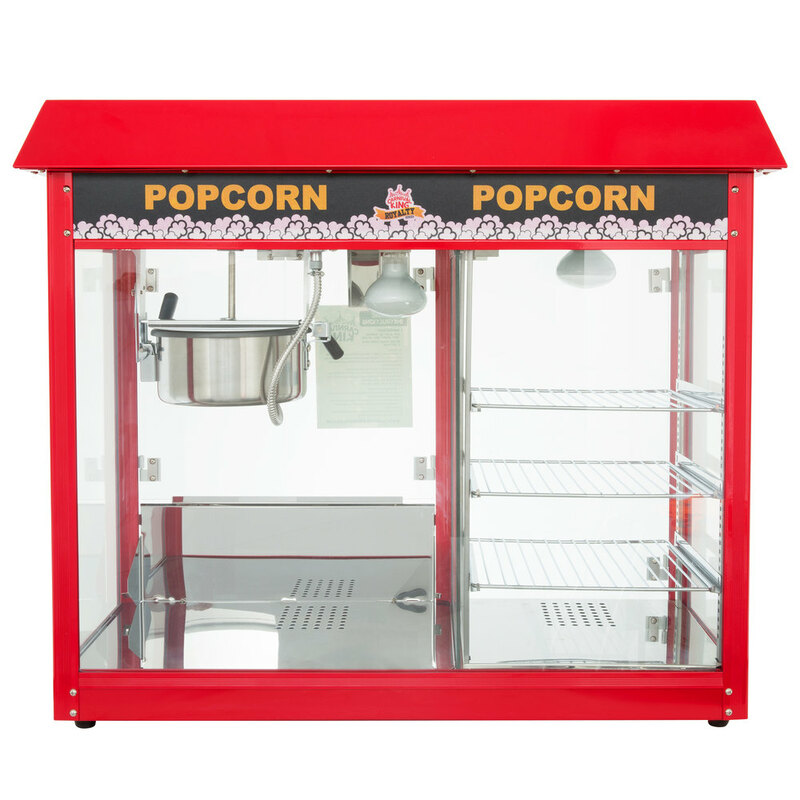 This unit features a 250W warming deck and a 60W 3 shelf display warmer side by side to provide an eye-catching, brightly illuminated space for your finished popcorn. The front, back, and side see-through clear panels that make up the cabinet are all made of heavy-duty plastic, while the removable crumb tray, kettle, and the interior top / bottom are made of stainless steel. Besides popcorn, the 3 shelf display warmer is also perfect for showcasing peanuts and nacho chips. This dependable machine features 1700W of power and has an 8 oz. kettle that only needs a few minutes to warm up, making it ideal for high-volume businesses. And, it's simple for your staff to operate. Four toggle switches control the popper lamp and warming deck, kettle heat, turner, and display lamp, while an easy-to-read digital temperature control screen with keypad lets you regulate and monitor the status of your product. A magnet holds the kettle lid up, so it's easier to add popcorn kernels and oil. The warmer / merchandiser holds temperatures from 110-130 degrees Fahrenheit to keep your concession stand treats hot and fresh. With the Carnival King PMW17R 8 oz. Royalty Series popcorn popper and merchandiser, you can keep up with demand serving fresh popcorn and putting it on display all within one handy, space saving unit! This unit requires a 120V electrical connection.